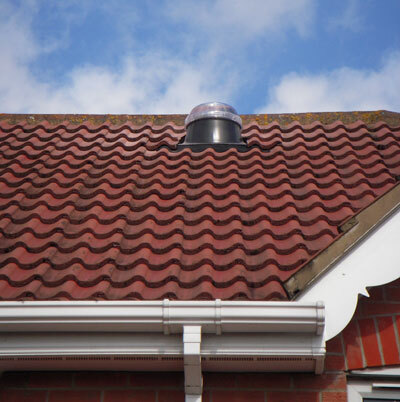 We carry out free onsite surveys, without obligation, where we can look at the possibilities of a sun tunnel installation and quantify the amount of material required. 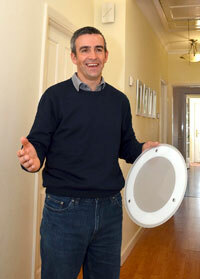 We can also give you a demonstration on the product, its performance and expectations of light output. This usually takes about half an hour, at a time convenient to you. We would then give you an indication of cost and either email or post a quotation to you. Should you wish to proceed, then no deposit is required and we can usually carry out an installation with a week’s notice. 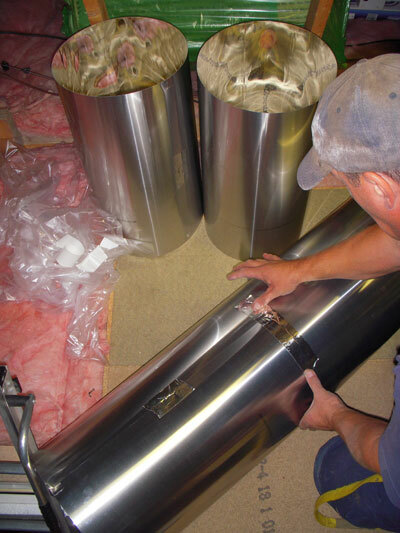 We use our own experienced, fully trained installers and do not subcontract. So we know who exactly is on your roof!! 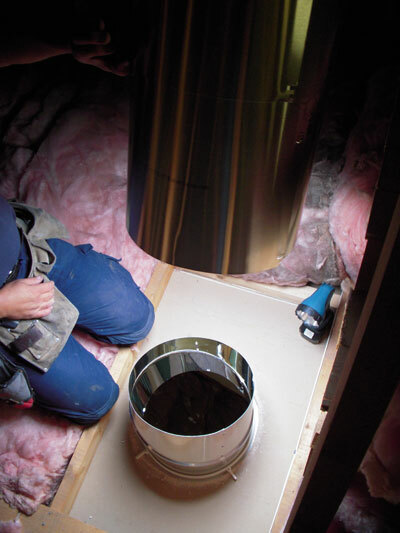 Installation, in most cases, would be completed in just one day, with minimal disruption to you and your home. Dust sheets would be set out and at the end of the installation everything would be as it was, apart from a new bright space of course!! Payment in full will be due on the day of installation and a five year guarantee will be issued. 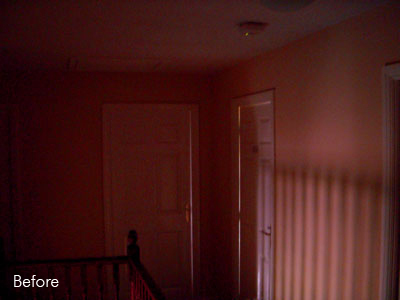 On this job the customer wanted to brighten up the landing at the top of their stairs, which as you can see from this picture is pretty dark. 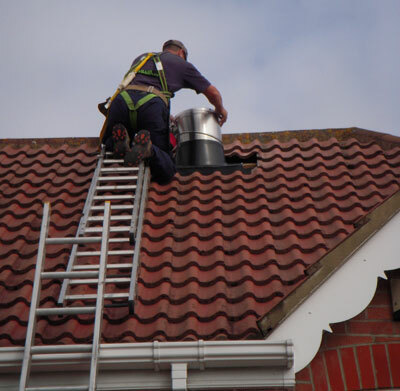 1) First, the safety aspect is checked by the installers and ladders secured. 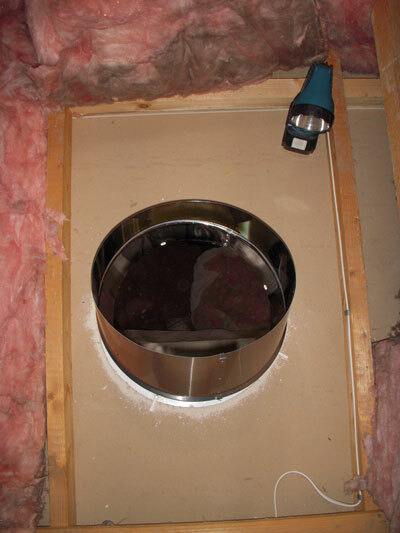 Once the position of the diffuser and dome exit points have been established, a hole is then cut in the ceiling. 2) The tube angles are set up ready for the break out through the roof. 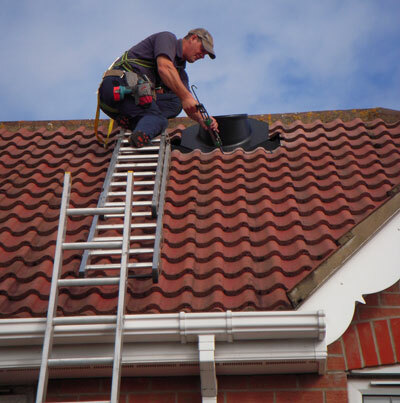 3) Tiles are removed carefully and the process of installing the flashing and weathering the roof from the elements can begin. 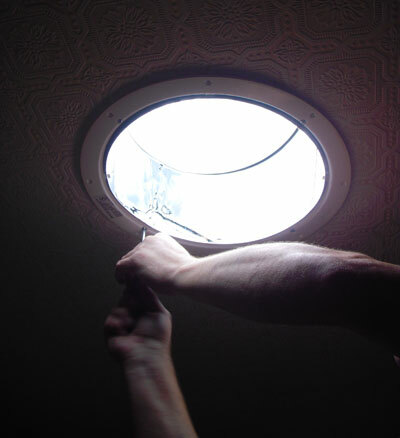 4) Once this has been done, the tube is then extended through the flashing and fastened. 5) The dome, with the fresnel lens is attached and the tiles are then re-laid and cut accordingly. 6) All joints are then sealed with highly reflective tape and checked for light sources. 7) The system is then checked for dust particles and the diffuser can now be fitted. 8) Now time to clear away tools, tidy up and admire the results. I hope you will agree, this is a dramatic improvement, all down to natural daylight and the incredible effects sun tunnel can have. 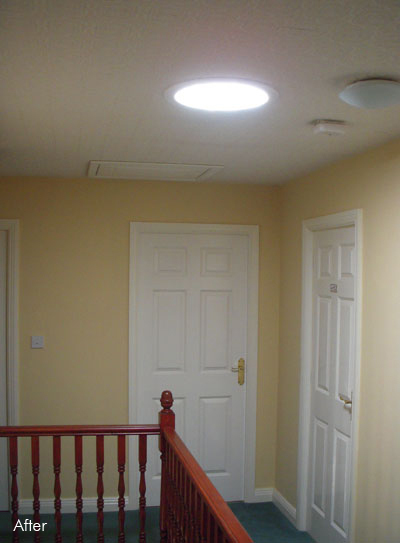 For a free no obligation survey and friendly advice call us any time on 0845 548 0844 or call Deane 07747 333380 so that we can bring daylight into your home.